Free download Empire Defense II game for Android latest version with APK file. It is very awesome game for you to play. The graphics of the game are amazing as compared to mobile device. Empire Defense II for android is completely automatic game to play. You have to plan the strategy so that you might stop the waves of enemies. You only need to position your soldiers on the way. 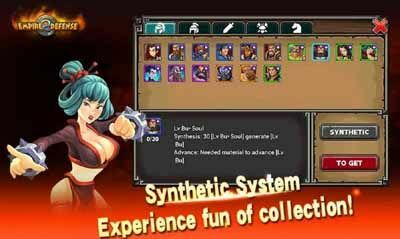 Empire Defense II for android has four menus which are Story, Arena, Store and achievements. In story mode, you have to clear the given stages. The second menu is Arena which cannot be accessed until you complete the two stages of story. In arena mode, you can make a challenge with online players. Here you will see your worldwide rank for this game. After defeating your opponent in arena mode of Empire Defense II for android, your will get some reward and also your rank will be improved. At the start of the game you can select the only unlocked general Liu Bei. At the start of each stage you have some moves for general to advance forward. When your moves will end then position your soldiers besides the way from where your general has passed. You have four types of soldiers at start which are Spearmen, Archer, Witch and Crossbow. You can setup all these soldiers accordingly for some coins. For example, if you want to position crossbow, then its cost is 75 coins while all other soldiers who are mentioned above are of cost 50 coins.